Most of the time my clients need to download data from their database tables. Exporting to CSV is a pain in the rear for users and it leads to confusion (you know the colon and semicolon stuff). Today, I decided to make a very small controller that is portable and efficient for exporting full MySQL tables to Excel 2003 using PHPExcel and CodeIgniter. 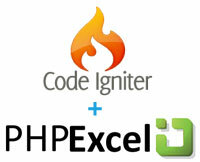 First of all, you need PHPExcel which should be installed as a CodeIgniter library. In order to do this, you should follow the steps posted here. Whenever you need to export data from a MySQL table, you just need to call this controller and pass the table name as a parameter, sort of like http://www.yoursite.com/table_export/products. Obviously, you should always add some sort of security measure in order to prevent strangers from pulling all your table information. Just add some session protection to your constructor and you’re set.